Margy Gates is an artist specializing in watercolors, plein air painting and clay. Giclees of her watercolors are available in multiple sizes. She also does commissions and boat portraits. Margy has been making art all her life. She holds a Masters Degree in Fine Arts from Claremont Graduate University in Claremont, California, where she studied with some of the iconic painters of the time including Millard Sheets and Phil Dyke. In 1978 she and her husband, two of their three teenage daughters, a cat, and a dog, moved aboard their 39-foot Overseas sailboat in the Channel Islands Marina in Oxnard, California. In short order, the kids graduated from high school and moved on, the cat and dog found other homes, and Margy and her husband Charlie lived happily for the next 24 years aboard s/v Malua at the base of the Whale’s Tail Restaurant. 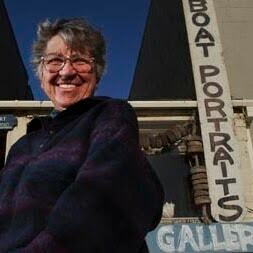 For 20 years her Sea Gate Gallery and Studio have been on the beach in a long, narrow space filled with treasures, dusted with sand from, and loaded with personality, snugged between a real estate office and the Rudder Room at the end of Ocean Drive in Hollywood-by-the-Sea.